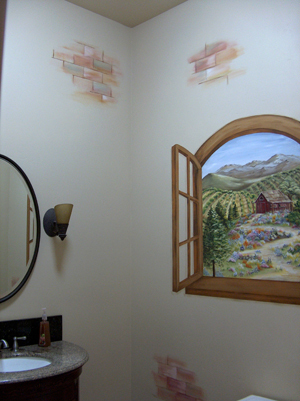 We added a custom designed window and exposed brick to this large, guest bathroom. 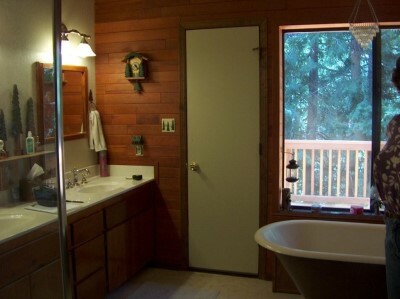 How do you put a window in an internal bathroom? With paint! 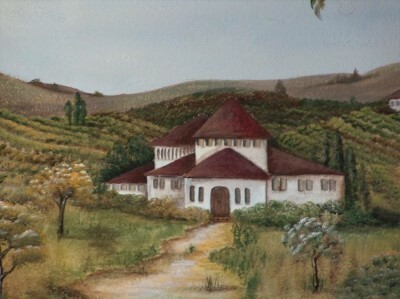 This mural is painted in an historic Bed and Breakfast in Placerville. 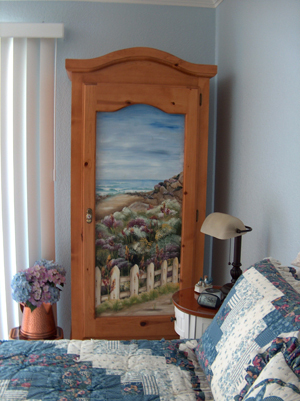 While the rest of the home has a traditional Victorian era feel to it, the master bedroom reflects the personality and humor of the homeowners. There's even a moose lurking in the shadows near the little stream. Can you see it? 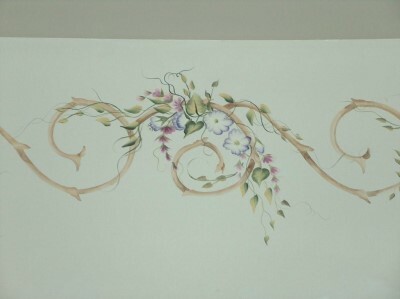 This motif is a combination of traditional stenciling with free hand and free form stenciling techniques. 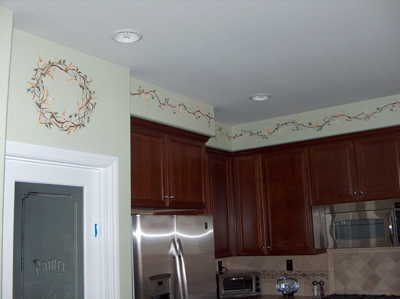 This design lends itself to many applications - borders, scattered motifs, coordinating with murals, etc. 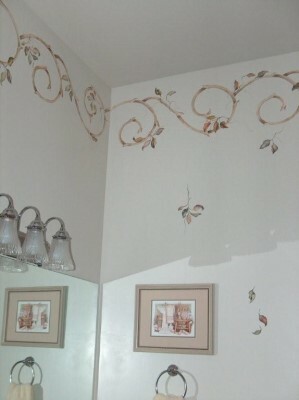 We designed the scroll and flowers for one bathroom and liked it so much, we decided to use it with leaves for the guest bathroom. You can see how one scroll can have more than one look. This is what the bathroom looked like when we first started. This is what the bathroom looks like now. See the difference? 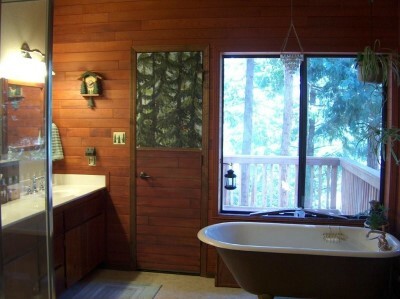 The door was painted to match the cedar planking in the room and the open "window" on top matches the homeowner's wonderful view from the tub. 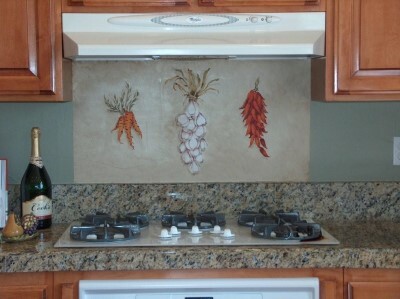 This backsplash is painted in the trompe l'oeil style. Using realistic colors and shading gives these veggies true dimension. Often, this space goes unused. 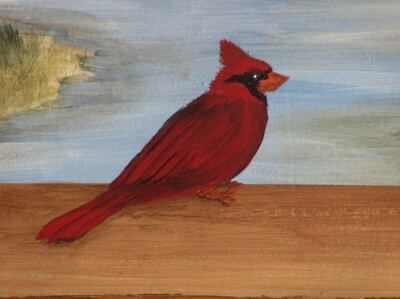 It is a great blank canvas for a small motif that makes a great visual impact. As you can see, this work of art took place in the air. 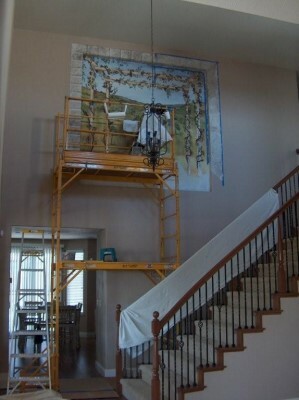 The bottom of this large mural was 12' off the ground. 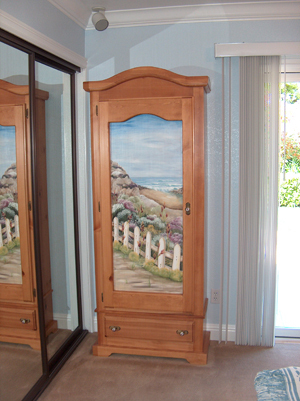 This was a large, grand entryway with an 8' x 10' empty niche. 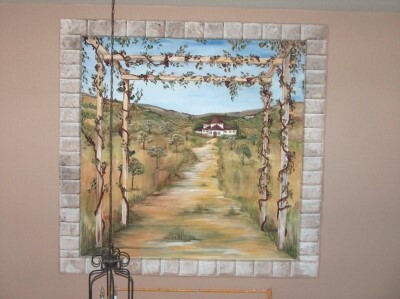 This view to an outside arbor and vineyard scene, with surrounding stone, created a focal point and filled in a blank wall. I was happy with the end result but even happier to get back on solid ground! This is an amazing train room, built completely to scale. 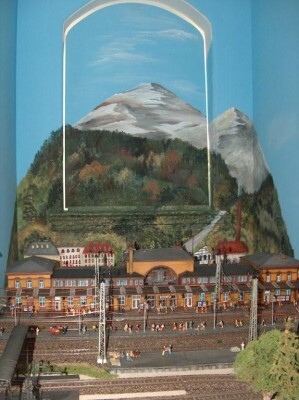 We are trying to create a German/Eastern European style backdrop for the trains. 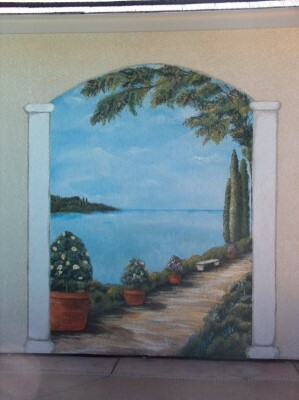 I have had the opportunity to paint landscape and sky details as the rest of the scene has been added. 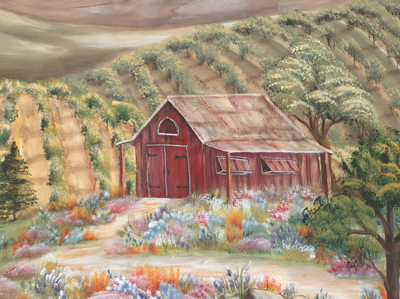 This mural is painted with outdoor paint on a very rough, stucco surface. 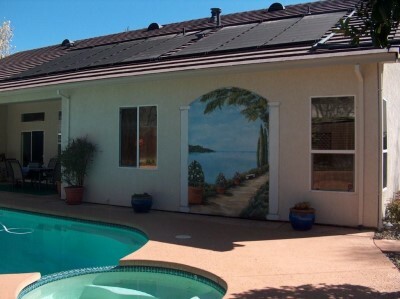 The image reflects the beautiful pool and colors in the homeowners backyard. Although it was hard to get fine details on such a rough surface, the pathway gives you the sense of dimension and depth. Doesn't it just make you want to take a walk? 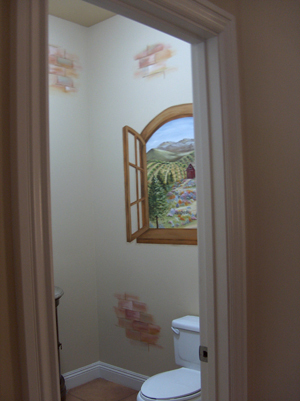 This is a little surprise in a guest bathroom - painted using the same colors and tones in the room. 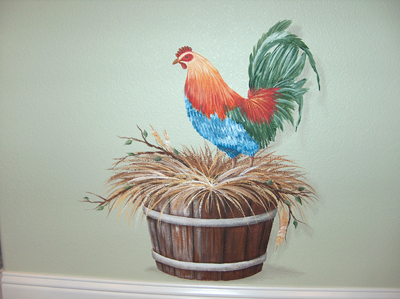 Custom designed border and wreath were developed to go with the client's love of roosters. Good job! We love our kitchen family room artwork, too. Sometimes the rooster crows too early in the morning, but we are training him!" 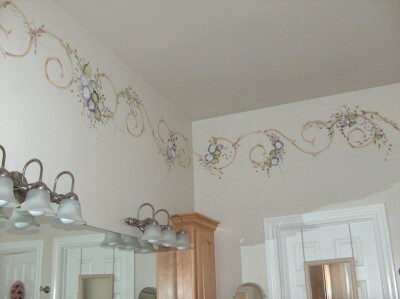 These homeowners had looked for several months to find the right "piece of artwork" to hang next to their beautiful tub. 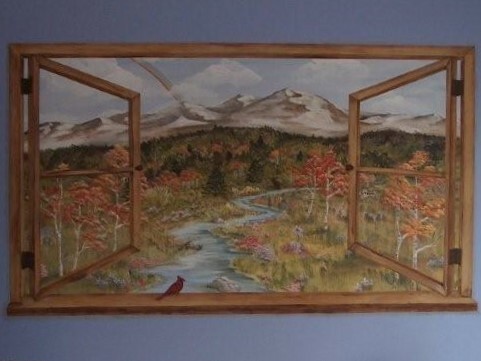 We designed the mural together, incorporating elements in the room, such as the wood work, custom tile work, and the view they wanted to see out their "window." 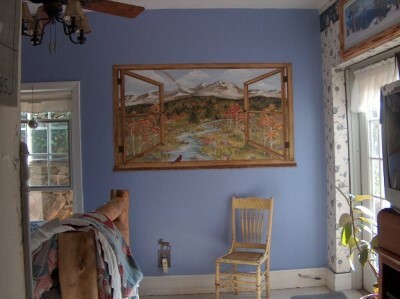 In addition to their real, westward facing view, they now have a new view out a faux window. Nancie worked patiently with us and helped us fill in the blanks of our own ideas and created a mural that was EXACTLY the look and feel we were hoping for. Nancie is very professional and a pleasure to work with. We know that she will be back to see us in the near future to help us further enhance the beauty of our home with even more of her great ideas and artistic solutions. This is some of the most challenging lettering work I have done to date. The entire mural is over 6' tall and was done on a 25' wall in our local church. I used a hydraulic lift to get to the wall. The lettering was made to order by the Mad Stencilist. They did an excellent job of creating a giant series of stencils for me to use to create this mural using our church's motto. 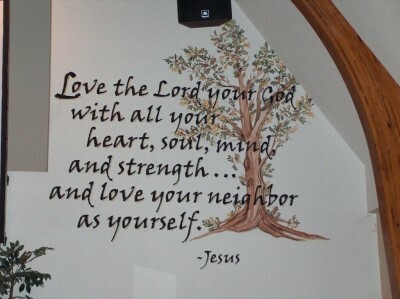 This is the second part of the high lettering murals for the Cold Springs Community Church. The murals flank either side of the main platform in our worship center. 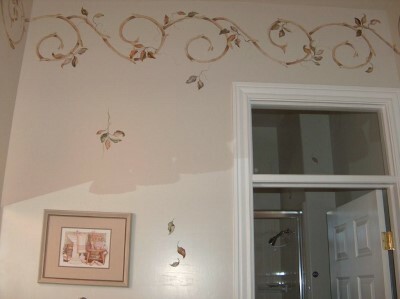 These are some of my best examples of stenciling in a “trompe l’oeil” style. Pronounced “trump loy,” this literally means to paint such that you “trick the eye” into believing the items are real. It calls for a lot of attention to detail and shading, but the effect is pretty nice - don’t you think? It makes you want to select a book to read! 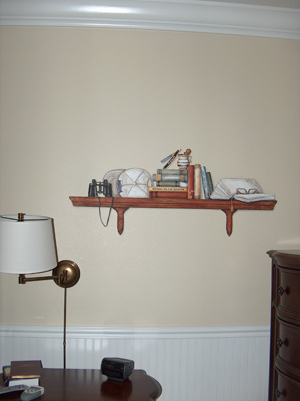 This is another example of a trompe l’oeil shelf. Imagine a shelf you never have to dust! This tone-on-tone effect can provide quite a dramatic look. For this room, I only used three colors - white, Payne's Grey (a very deep blue/grey), and Moon Yellow. This plant stand motif was acutally commissioned by the man of the house. He does most of the cooking and wanted something perennially beautiful to look at while he was in the kitchen. These blooms will never fade - promise!! 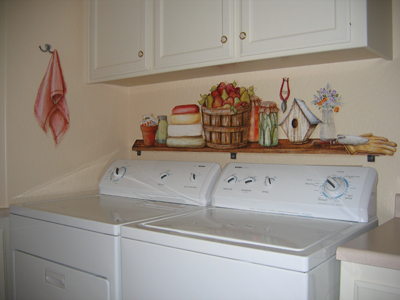 This client was updating an 80's kitchen with little available wall space. 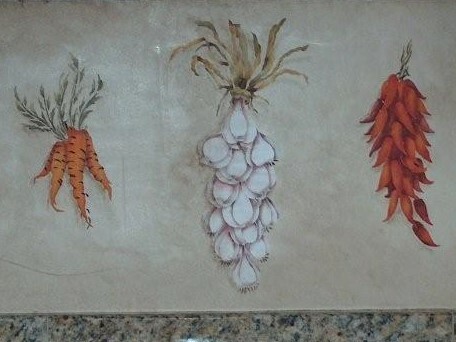 She repainted her cabinets and we created beautiful unique fruit/vegtable motifs to bring color and character to her "new" kitchen.